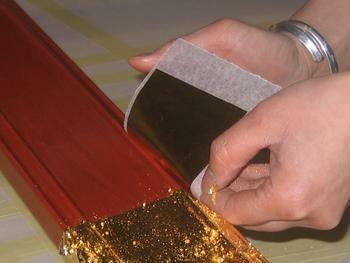 Gold leaf may also be applied by transfer using waxed paper. The gessoed and boled frame is brushed with oil size, then left until it reaches the right degree of tackiness, before applying the leaf. Though quicker than water gilding, this process results in a gilded surface unsuitable for burnishing, and does not display the distinctive water gilded bands produced by the overlap of the leaves.